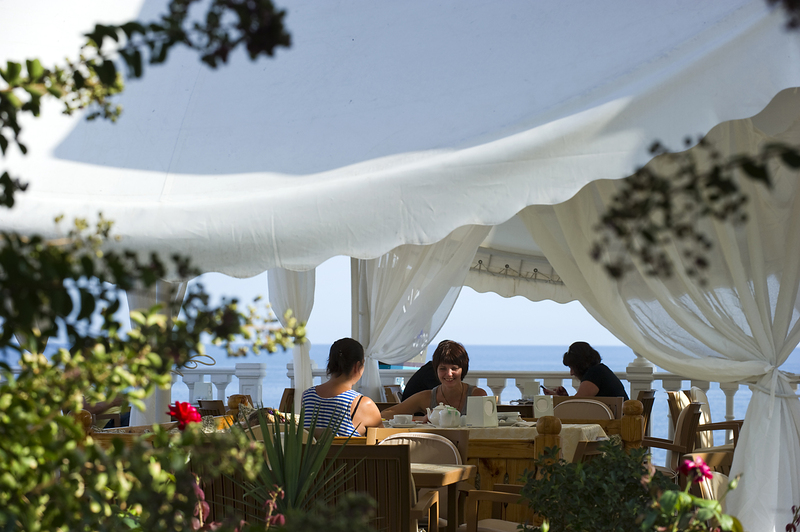 Holidaymakers at a cafe of the Relax Center Irei hotel in Semidvorye near Alushta, Crimea. The Crimean minister for resorts and tourism, Sergei Strelbitsky, is convinced that the ‘terrorist attack’ alleged to have recently taken place on the Russian-Ukrainian border in Crimea will not affect the disputed peninsula’s tourist industry: He says the flow of Ukrainian visitors has risen in 2016. Armed clashes reportedly took place in northern Crimea in early August involving a group that, according to the Russian Federal Security Service, had come from Ukrainian territory to commit acts of terrorism in public places and thus disrupt the tourist season on the peninsula. The minister of resorts and tourism of Crimea, Sergei Strelbitsky, gave his view on the impact that the alleged incident may have on the region’s tourist industry and on how the tourist season is going. Vzglyad: Following the events in the north of the peninsula, will advice be issued to refrain from visiting certain parts of Crimea? Sergei Strelbitsky: No, we do not expect any restrictions. We are operating as usual. These events have had no effect at all on our work, the ministry’s work or the region’s tourist facilities. The Ukrainian authorities have advised their nationals against visiting Crimea. Will this affect the region’s tourist industry? S.S.: Not at all. Ukrainian citizens will continue to visit Crimea just as they have been doing. The evidence of this lies on the surface: I suggest the Ukrainian authorities take a look at the number of vehicles with Ukrainian license plates that are driving around Crimea. What’s more, these license plates come from different parts of Ukraine. We are very glad to welcome Ukrainian visitors. People come, see how Crimea is, how it is developing. And the propaganda that they are subjected to on the territory of the neighboring state comes undone when they face the reality. How many Ukrainian tourists have been to Crimea? Do you have the relevant statistics? S.S: This year, we have received 4.6 million holidaymakers. Some 10 percent of them are Ukrainian citizens. In June this year, Ukrainians made up about 9 percent of all visitors to the peninsula. The July figures are being finalized but I can tell you that Ukrainians’ share rose to about 15 percent. In other words, the tourist inflow from Ukraine has increased by a factor of 2.2 compared with 2015. Where do these figures come from? To what do you attribute the increase in the number of Ukrainians holidaying in Crimea? S.S.: I can see the increase but I can’t say what is driving it. As regards the figures, each year we conduct a survey among holidaymakers. This year was no exception. The survey has been in progress since May. I think that once it’s over (the survey will run till October), when we have received data from all the relevant services (those responsible for migration control and so on), we shall be able to say what this increase in the number of visitors to Crimea is due to: word of mouth or something else. How many tourists do you expect to visit Crimea this year? S.S.: Around six million. This is a target that we still hold valid because interim statistics show that our forecasts are going to be justified. Do most of the tourists rent private accommodation or stay in hotels? S.S.: Once again, we shall receive accurate data in October. For the time being, I can say that there are many tourists staying in sanatoriums, hotels, boutique hotels and in rented accommodation. The tourist season has been a success. The article has been published in abridged form. First published in Russian by Vzglyad.